We are always looking for wonderful books to add to our holiday book collections, so this year we dug deep to come up with some titles that are new, a little quirky and mixed them with some classics. We hope you find something to add to your collection. 1. Lucky Lazlo -sometimes the path to love requires a bit of luck. Lazlo is in love with the star of his town's production of Alice in Wonderland and as luck would have it he is able to procure the last red rose to gift to her on opening night. But, as Lazlo makes his way to the theater his luck turns as a ginger colored cat snatches his flower and makes his own unexpected contributions to the show with Lazlo in tow. 2. Before You- this book is a fun and beautiful poem, an ode to the people who make your world come alive. "I was a noodle without soup. Just a cone without a scoop...Then you arrived and changed the tune! You woke the sun. You lit the moon." As you can see, the metaphors are clever and they pair wonderfully with simple and humorous illustrations. This is Taryn's favorite Valentine from this year. 3. Hug Machine- The Hug Machine is a natural hugger who understands that sometimes even the most unlikely of recipients (ahem, porcupine) needs a little snuggle and it's his mission to dole out the hugs where they are needed. This is an adorable read that combines the perfect amount of sweetness with humor that make it a fresh and fun addition to any Valentine book collection. 4. I Heart You- this sweet read provides some seriously sweet eye candy. Illustrated by Sarah Jane Studios and written by Meg Fleming, the simples phrases sprinkled throughout combine with the gorgeous illustrations to evoke all of the feelings of parenthood. 5. Hans my Hedgehog- one of the lesser know Grimm's fairy tales, this quirky Valentine pick features a half human, half hedgehog, fiddle playing, rooster riding protagonist with a pig posse. Yes, you read that correctly. Hans is searching for his place in the world and a love that will accept his rather unique circumstances. 6. The Friend Ship- everyone needs a good friend in this life, and in Kat Yeh's lovely book we see that sometimes on our quest for friendship we may overlook the friends that have been right beside us all along. A wonderful reminder that friendships may be found in the most obvious places if we only care to look. 7. 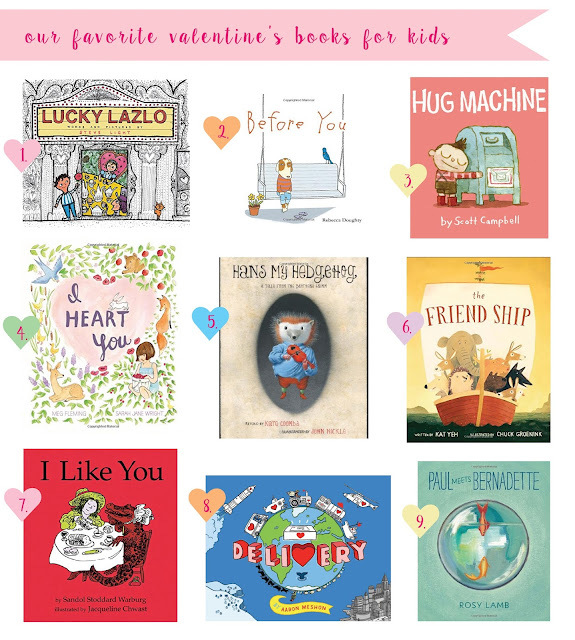 I Like You- we believe that no Valentine's booklist is complete without this classic and beautiful book on friendship. We love how something so profoundly wonderful, a true friend who loves you exactly as you are, can be captured perfectly in a simple picture book. 8. Delivery- this incredibly well done book follows a box of heart shaped Valentine cookies as they make their way from Grandmother's oven into the hands of the intended recipient. This nearly wordless picture book is sure to delight as one follows the delivery as it travels by truck, train, boat and even rocket. The illustrations are filled with movement and color in all the right places. 9. Paul Meets Bernadette- Have you ever met someone who rocked your world? That's what happens when Paul Meets Bernadette. All within the confines of a fish bowl. These illustrations, painted in oils by artist/author Rosy Lamb are not to be missed.